Vogelbach's struggles over the last 10 days forced the Mariners to change their mind on his locked in spot on the roster. 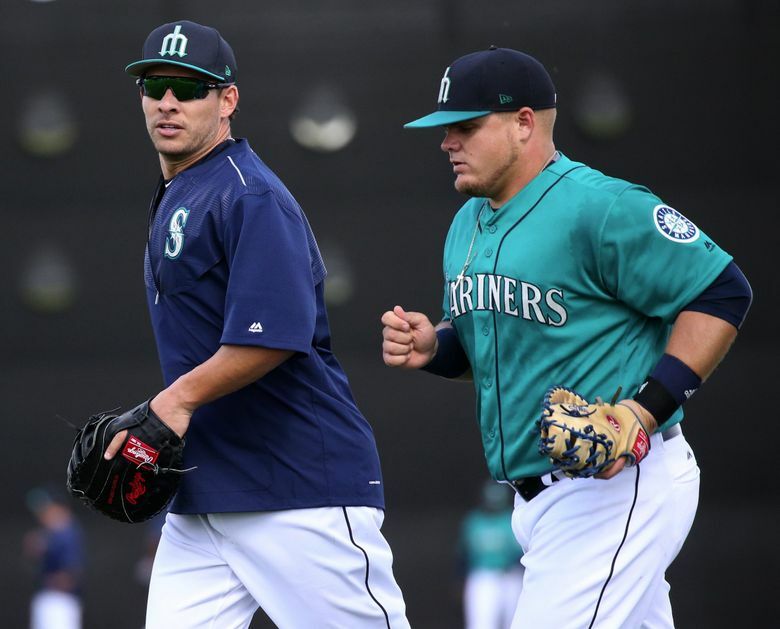 PEORIA, Ariz. — Daniel Vogelbach’s status on the Mariners’ 2017 opening day roster seemed to be a forgone conclusion based on everything the organization’s leadership, specifically general manager Jerry Dipoto and manager Scott Servais, said this offseason. They viewed him as ready to make the next and large step from Class AAA to the big leagues in a platoon role at first base with veteran Danny Valencia. On Thursday with 11 days until the season opener against the Astros at Minute Maid Park, the Mariners optioned Vogelbach to Class AAA Tacoma. “I still feel Vogey will have a big impact on our season, but sending him to Tacoma to start season we feel is the best thing for him and the team,” Dipoto said. The roster move was somewhat surprising given the optimism with which the Mariners discussed Vogelbach’s viability as a rookie starting for a team that had postseason aspirations. But based on how Vogelbach had performed this spring, particularly in his last 10-12 games, it also should have been expected. Vogelbach was hitting .228 (13-for-57) with a .313 on-base percentage and .333 slugging percentage with two doubles, a homer, five RBI. But he had struck out 19 times this spring — a trend that was uncharacteristic for him. Component post 10297485 could not be found. The current Mariners’ front office has shown similar restraint in the past, not wanting to push unprepared players to MLB competition. Valencia will now serve as the every day first baseman instead of sharing the role in a platoon. He hasn’t exactly hit well this spring. His numbers are worse than Vogelbach’s. Valencia is batting .196 (9-for-46) with a .288 on-base percentage with three doubles, a homer and five RBI. But he also hit .287 with a .792 on-base plus slugging percentage, 22 doubles, a triple, 17 homers and 51 RBI in 130 games last season with the A’s. Over his last three seasons, he’s posted a .285 batting average with a .785 OPS. Valencia had been used as almost a strictly platoon player early in his career. But the last two seasons, his at-bats against right-handed pitchers have increased. In 2015, he had 229 plate appearances against righties, hitting .285 (61-for-214) with an .881 OPS, 17 doubles, a triple, 13 homers and 39 RBI. In 2016, he had 373 plate appearances against right-handers with a .275 batting average (94-for-342) with a .742 OPS, 15 doubles, a triple, 10 homers and 32 RBI. The Mariners asked Vogelbach to do several things this offseason: trim down his frame, work on his agility and flexibility and improve his overall defense at first base. He did all those things in a relatively short time frame. While the defense had improved significantly, the offense — his best asset as a player — had grown into an issue. He struggled with his approach, looking overwhelmed at times. He was late on fastballs that he should’ve handled. The Mariners asked to be a little more aggressive on fastballs and it was something he struggled to do in recent weeks. Struggling to hit a fastball and incorporating it into his approach isn’t something that should have been an issue. But the strikeouts mounted in the last 10 days. It was clear he couldn’t work on that aspect at the big league level. Vogelbach had cleaned out his locker and headed for the minor league side of the clubhouse earlier on Thursday and given the day off. He will start playing in minor league games on Friday. Will the Mariners go out and search for a left-handed hitting first baseman to compliment Valencia? It doesn’t seem to be on their immediate agenda though Dipoto is constantly tweaking his roster. He’ll certainly look at possible options and players being designated for assignment in this final week. For now, Taylor Motter will serve as a back-up first baseman as part of his utility role. He’s looked solid at first base over the past few games.